KandyPens is almost as rabid in their pursuit of perfection as first-class box mod manufacturers like Wismec and Vaporesso. But, as those companies focus on the e-liquid demographic, KandyPens keeps it old-school by going after all those aromatherapy enthusiasts out there. Especially, in the now-exploding market of waxes and concentrates. The newest KandyPens offering comes in the form of two vape pens, the KandyPens Prism and the KandyPens Prism +. The two vape pens specialize in vaping waxes and concentrates, and the only noticeable difference between the two of them is their size, of which there is not much difference. There are also LED lights on the Prism + that the Prism does not have. The Prism is the smallest of the two, in more ways than one. 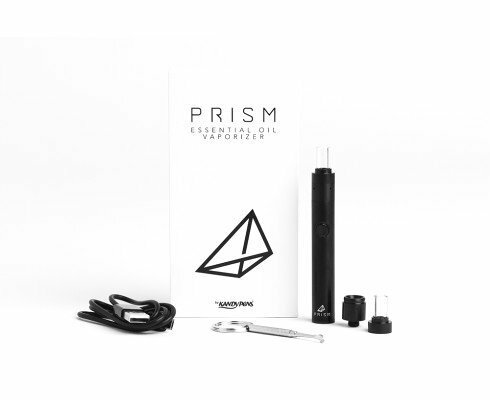 The Prism has a slimmer build, and has a 320mAh battery inside, while the Prism + has a 900mAh battery. So, you are obviously going to get a longer battery life from the Prism +, for the slight tradeoff of extra bulk. But, as I said, the sizes of the two models don’t amount to much. Both devices can vape at sub-ohm resistances, and they each include two atomizer options that fuse the best of coil atomizers and dish or disc-shaped atomizers. There are also four temperature settings on each device that let you customize your vaping experience. To be clear, this is not a 2-for-1 deal. You either get the Prism or the Prism+ – they don’t come packaged together. For this review, I’ll be looking primarily at the Prism+ version. Although, I would’ve liked to get the slimmed down version of the Prism since I love all things slimmed down. The Prism+ has the shape and feel of a lot of similar devices. It is all-round and flat and has no depressions or grooves to make for a more comfortable grip. The entire body of the Prism+ is stainless steel but coated with a black rubber casing. Both vape pens stand at over 100mm. The Prism+ has a USB charging port on its side, on the opposite side of the LED battery indicator lights. There is a central firing button on both the Prism and Prism+. The mouthpieces of both devices are made of glass to ensure a smoother, purer vapor path. I thought that the interface was a little confused. I would like to have seen everything grouped, maybe right under the central firing button, which is common with box mods. But as it is, the design choices were not bad ones. And the position of the USB charging port is one of the differences between the two devices. The Prism has both a regular USB charging port along with a lightning USB charging port like on most smartphones. And they are on the bottom of the device, while the Prism+ has its USB port awkwardly sticking out on the side. The two devices both have internal batteries, so I wasn’t sure why they had different USB port placements. But, whatever. The coils on all of KandyPens’s devices are sights to behold. I remember reviewing the KandyPens Donuts vape pen that was the first time they premiered their new donut-shaped heating element. And now, it comes standard on most new KandyPens devices. The two different atomizers allow for two distinct vaping experiences. Both of them are great, but they offer different styles of vapor. Whereas the coils heat up quickly, the disc takes a little longer, and as such, creates a denser, smoother vapor. The coils attack you with intense flavor, and they don’t hold back from throwing big, thick clouds at you. The coils get placed into the chamber that gets screwed off by holding onto the mouthpiece section, which also has a few air holes in its body. I started my review of the KandyPens Prism+ by using the ceramic disc-shaped coil. I had a great vaping experience with the KandyPens Donuts, and it has become one of the reasons why I enjoy KandyPens products so much. There are four distinct temperature settings on both the Prism and Prism+ that are indicated by the different color of flashing light around the firing button. You can switch between the various heat settings by clicking on the firing button three times. Yellow is the lowest temperature (320F), followed by green (350F), red (390F), and blue, which is the highest temperature setting at 430F. Once you’ve loaded the chamber with less than a half a gram of dab, you screw back on the mouthpiece, click the firing button five times and then choose your temperature. You click the firing button and inhale. The only real adjustments that you can make on either the Prism+ or the Prism is the choice of the coil you use and the heat setting. 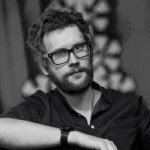 And depending on your tastes, whether you are a smooth operator or a sandpaper-in-the-back-of-your-throat person, you would have to choose a combination of the two to get an ideal vaping session. I turned on the Prism+, and I went to the second-highest temperature setting at 390F. The chamber did not take any extra time whatsoever to get to vaping my material. I got smooth, full-bodied flavor almost instantaneously. I finished off the dab/oil I had left in the chamber, and I loaded it up again. This time I went to the maximum temperature setting at 430F, and the clouds were overwhelming. I got an instant throat scratch, as the clouds attacked my bronchioles severely. Not the device’s fault whatsoever, but the heat was intense and the vapor even more so; good thing I didn’t have the dual coil atomizer. The dual-coil quartz titanium coils worked beautifully, however. They heated up quickly and pushed out humongous clouds with loads of flavor inside every droplet. The KandyPens imprint puts out quality products that are often out of the reach of the competition. However, reviewing the Prism+ reminded me a lot of the Mig Vapor Yabba Dabber that also came with two atomizer options, but could even vape dry herbs. The Yabba Dabber had a 500mAh battery that worked great, although there were no adjustable temperature settings available, which does put it at a disadvantage against the Prism+. The firing button is what you used to control, more or less, the temperature of your device on the Yabba Dabber, which was a tricky situation if you held too long onto the firing button. And for that alone, the KandyPens Prism+ takes it. You can’t adjust the temperature to the degree with the Prism+, but by choosing and locking a preset temperature saves you from having to hold onto the firing button regularly. The KandyPens Prism+ is also extraordinarily well-built and comes with a lifetime warranty. The KandyPens Prism+ takes the guesswork out of everything. The atomizers are easy to swap out; setting the temperatures is intuitively simple, and there’s not much else to the operation of the device. You load it and vape. The KandyPens Prism+ has a stainless steel body, a built-in 900mAh battery, and a glass mouthpiece that increases vapor purity and flavor. The button worked well, and there was no rattle or other disturbing noises, and it felt great to hold and use. The inclusion of two coil options is what set this kit and the KandyPens Prism+ above the rest. The battery and temperature provide the right amount of heat and power to either coil system that responds, in kind, by creating either smooth, tasty clouds or harsh, sandstorms of vapor that is also pretty nice. Again, I was expecting something different, looks-wise, for a KandyPens product. Instead, they opted for the elongated, tubular design of most modern wax vape pens, but I guess there is something to be said about getting back to basics. KandyPens seems to want to be even better than KandyPens with the quality and efficiency of their wax vape pens. The Prism and Prism+ were two devices that worked wonders regarding vapor production, as well as with the speed and ability with which they vaped. Their builds and interfaces were top-notch; they were both made with quality materials, and the temperature settings were more than enough to deliver either intense or soft-tasting vapor clouds. These are two genuinely perfect models. And although I would’ve liked to see some odd, eccentric design element, the performance and quality of either Prism more than made up for it. V2 Pro Series 7: portable vaporizer that can handle various mediums and heat to insanely high temperature without breaking the bank. The Pax 2 Vaporizer — Portable, Durable and Powerful Herb Vaporizer With an Outstanding Interface and Prolonged Battery Life.